To those knowledgeable in chemistry, the ring design is instantly recognizable. It is a hexagon with a circle in the middle – the classic representation of the benzene ring. ACPA members will also recognize this as the basis for the design of their professional stamp. The ring will have the letters “ACPA” as well as your membership number (M0000) engraved inside the band. 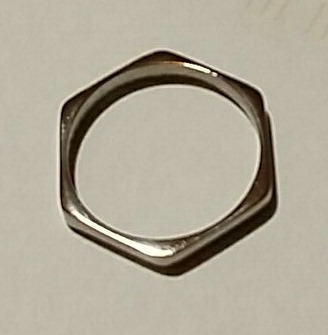 Other professional chemical societies may adopt this ring with their own engraving style. It will continue to demonstrate that you are a member of the chemical profession practicing in a distinct region. Although this will be your personal choice, the accepted method of wearing a professional ring is on the last finger of your dominant hand. The dominant hand is considered to be the working hand, from which a person's strength flows. For the majority, this will be the right hand. For many of us, this ring will be a continuing reminder of the trust that society has placed in us and of the ethical rules of our profession. In addition, it will provide a tangible symbol for the public and other professionals that the wearer is a professional chemist. To maximize the ring strength and to ensure comfort for the wearer, the ring will not have completely straight edges or sharp corners on the outside circumference. The ring was tested and was found to be comfortable and durable while doing office work as well as while performing fairly heavy physical labour. The rounded edges do not interfere with the use of laboratory gloves worn while performing low-risk analysis. You should, of course, remove all jewelry to maximize personal safety if you work in potentially hazardous situations. The ring may turn slightly at various times but still remains comfortable. The Chemist's Ring is available for sale to any ACPA Professional Chemist who is a member in good standing. Completion of the Professional Ethics for Chemists and the Jurisprudence courses is a requirement to remain a member in good standing. Note: Titanium ring does not come engraved with ACPA and your membership number. Prices for individual rings are in Canadian funds. Each price is based on approximately 5 grams of material. The prices for rings may fluctuate with global metal prices. P. Chems in good standing may click here to order online. Titanium rings are ordered in bulk from China about once a year or when a sufficient number of rings have been ordered to obtain our bulk pricing. Your patience is appreciated.